The soft dirt provided a wonderful bed last night. We both slept well wearing our ear plugs as the wind howled through the trees above. Andy continues to be our natural alarm clock. He wakes up between 5:39 and 5:45 am every morning. When he wakes up, he usually wakes Laurie up too. But unlike other mornings, today Laurie woke up not wanting to hike. She was comfy on her mat and cozy in her sleeping bag. This morning was one of those mornings when you just don’t want to do anything, you know? We started walking a little past 7 am, as per usual. A number of hikers had already passed our tent – none of whom we recognized. The trail was beautiful, twisting through a pine forest. Our feet and knees appreciated the soft ground and relatively flat terrain. 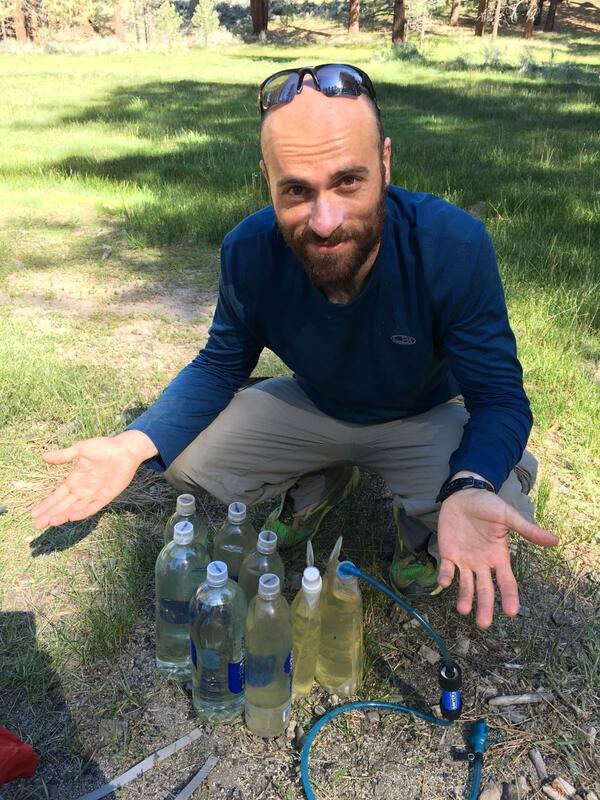 We walked 5 miles to Lander’s Spring and fire tank – our last reliable water for 43 miles! There are supposed to be two water caches along the route but no one knows for sure how often they are maintained. Last thing Andy wants to do is put us at risk by relying on a cache. So with that in mind, we filled our water bottles to capacity. Andy carried a total of 9 liters and Laurie carried 8 liters. That’s 19.8 and 17.6 pounds of water we’d be carrying to last us until Tuesday morning. We both felt good about our decision. It’s easy to second guess yourself out here. It’s easy to want to do what everyone else is doing. But that’s usually how people get in trouble. We’d rather carry the additional weight than walk up to a dry cache. After filling our bottles, repacking our backpacks and chit chatting with other hikers, we set off again. Our packs were heavy, but not as heavy as we thought they’d be. 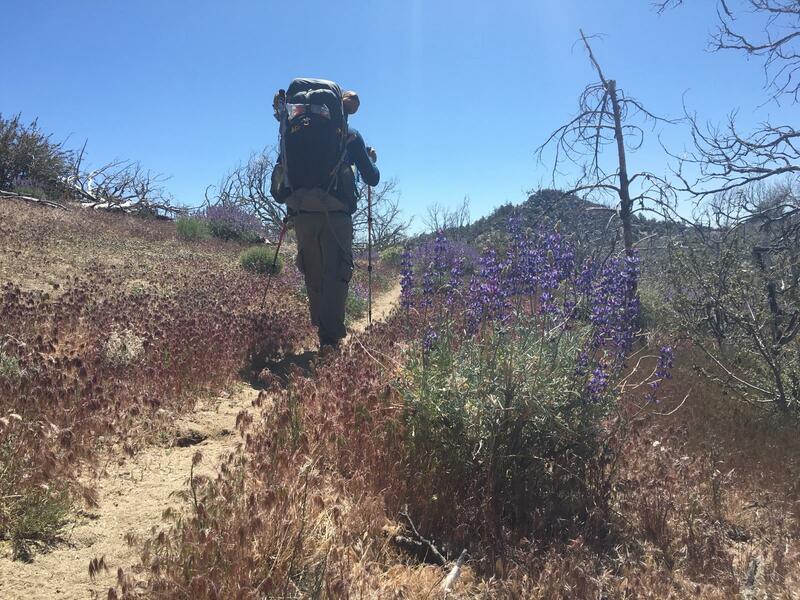 Soon we walked out of the forest and into a burn area where lupine lined the trail. We gradually climbed and then descended down to Kelso road. We chatted about what sections of trail we really liked and would visit again. We also discussed our expectations and how they compared to reality. Andy has been reading trail journals for many years and felt he knew what to expect. Now that we are out here we realize that most of what we, and others, write about are the highlights of the day. They are the things we remember when lying in the tent at night. What we forget are the usually temporary but nonetheless bothersome daily discomforts (pack not fitting well, achy feet, tight muscles, pain with every step when walking with blisters, baking in the sun, negative thoughts, anger, etc), and the daily joys (feeling as if you can walk forever, the stunning scenery, birds chirping, the wildflowers, the sudden breeze cooling you down during the long climb, bursting with laughter in the presence of others, reuniting with hikers from hundreds of miles ago, etc). All of these emotions and experiences can be hard to put into words. It is the combination of feelings of joy, pain, elation, fatigue and pride that makes this trail and experience so special. When we finally made it down to Kelso Road, there were two cars parked in the pullout. One belonging to a day hiker who had left out a cooler of soda (unfortunately they were all gone by the time we got there) and the other was a 4 runner under which hikers laid in search of shade. We found some shade up a hill under a Joshua tree. We had a relaxing lunch as we watched the activity of other hikers down below. Kiter, a hiker we had last seen at Paradise Cafe, showed up right as we were leaving. It was great to see a familiar face! 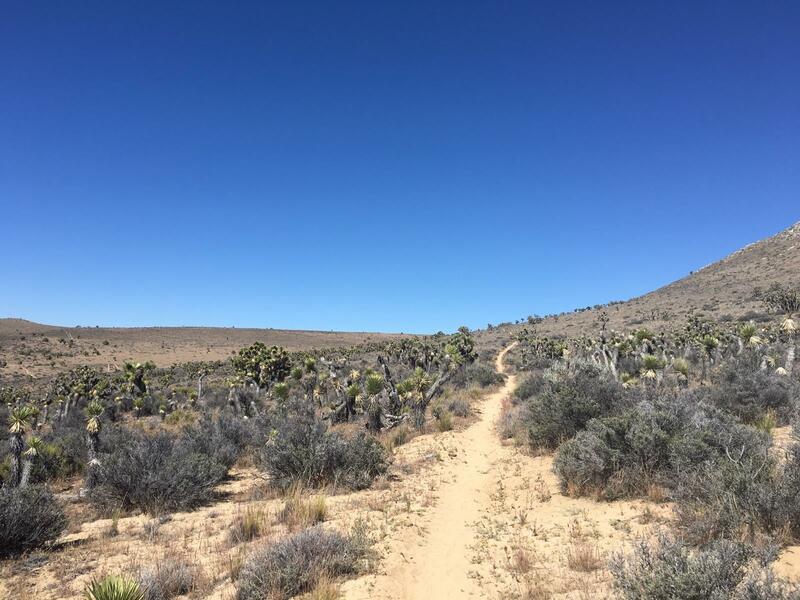 We chatted with him for a few minutes before hiking into the dry and arid desert. This was probably the most desolate section we have walked through as of yet. Joshua trees speckled the backdrop and gave us something to look at as we fought the wind. Initially we had a tail wind and Laurie was able to use her umbrella. After the wind suddenly changed direction and flipped her umbrella inside out we aborted that idea. The wind continued to howl as the trail wound around the hills, with our tailwind turning into a side and headwind. It made it hard to walk. Neither of us could believe how remote, dry and inhospitable this place seemed. 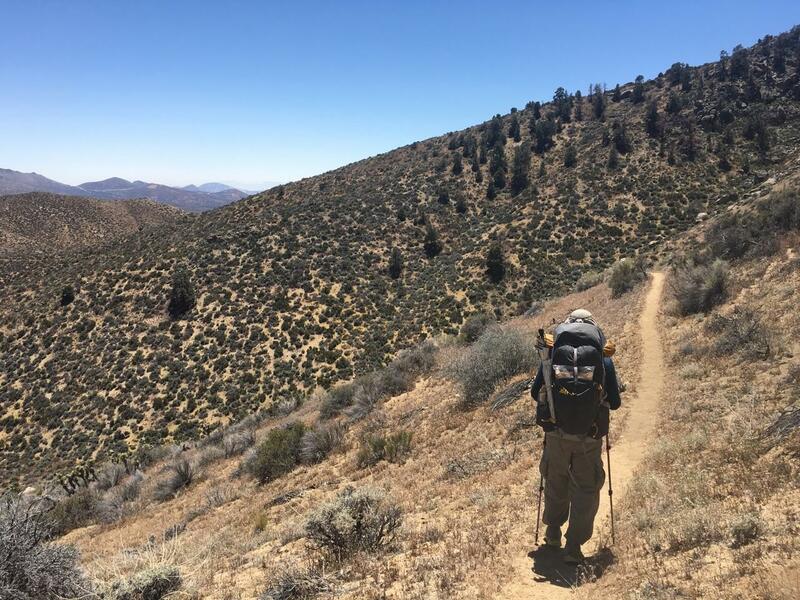 Before we started hiking the PCT, this is what we imagined most of the desert section of California would be like. It feels as if this place should be enjoyed by those on dirt bikes or atvs, but surprisingly it’s not too bad on foot either. Mind you the temps today were in the 80s with a cool wind. Around 6 pm we finally found a flat spot next to a Joshua tree. We looked around for a spot that offered more protection from the wind but could not find anything. We set up our tent, and not even 2 minutes later a huge gust of wind ripped one of the stakes out of the ground tossing the tent into a bush. 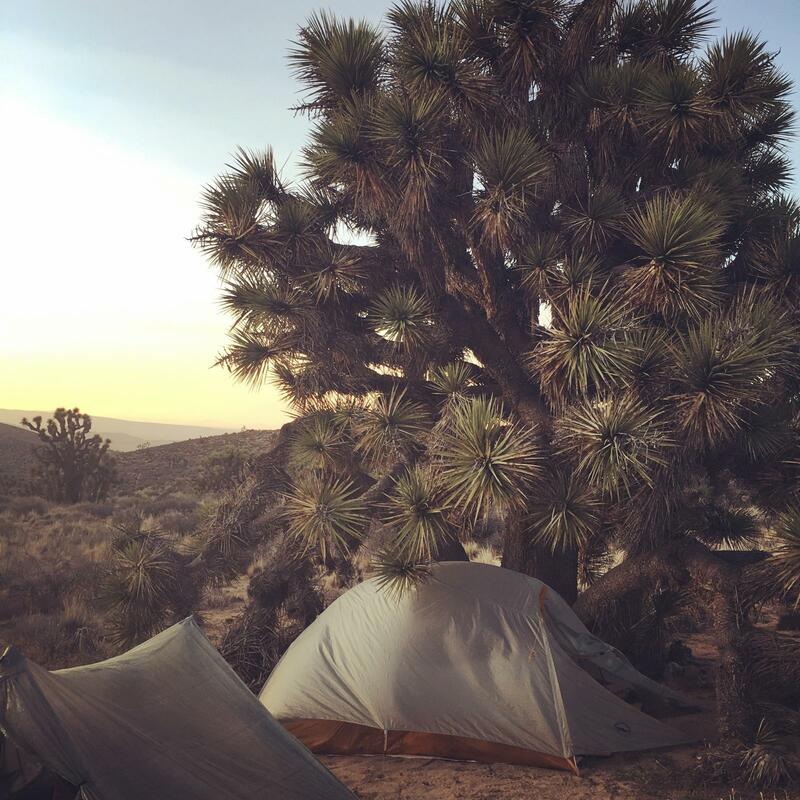 Immediately thereafter we moved the tent under the Joshua tree hoping to be more protected from the wind. It’s not as flat of a spot, but hey, out here, in these conditions, we’ll take it! Kiter showed up looking very tired and camped right next to us. It was nice to share the evening with him. We shared our food and traded stories from the warmth and protection of our respective tents, shouting above the wind. We were hoping the wind would die down after the sun set but it’s 9:15pm now and it is still howling. We hope that our tent stays standing throughout the night. Tonight we are grateful for tailwinds and our tent rain fly which offers another layer of protection from the wind. Hi Andy and Laurie , glad to see you are putting so many miles behind you . Love the photos and your documentation ! It’s like reading a story . Thanks for sharing your experiences . From Robert and Patti at the mile 549 water cache..